My husband & I fell in love with grilled pizza last summer. My dad bought us a HUGE gas grill for our housewarming present after he helped us with our cross-country move. (This thing is big - 4 or 5 burners, plus a stove top on the side - it takes up most of our deck). However, it's large burner size is great for pizzas! I don't know what made me decide to try grilling pizza last summer. I think it was the fact that it was hot out, our 3rd floor apartment was steaming, and I didn't want to start the oven to make pizza. Well, it's finally grilling weather again (55 degrees in early March - I am NOT used to this! ), so we decided it's time to grill pizzas! The dough is extremely easy to make & tastes delicious. It complements any type of topping (we've done everything - BBQ Chicken, buffalo chicken, shrimp scampi, margarita, pepperoni, chicken pesto, etc). The recipe makes 4 nice sized pizzas (10-12 inches). If I'm very hungry, I can finish one off on my own, but 1/2 - 2/3 makes a nice meal size. Place water in the bowl of a stand mixer fitted with a hook attachment, sprinkle yeast on top, and let rest until mixture is bubbling, about 10 minutes. Meanwhile, place flour, sugar, and salt in a large bowl and whisk to combine. Oil a second large bowl and set aside. When yeast mixture is ready, add flour mixture and olive oil and mix on low until flour is moistened and dough starts to come together, about 1 minute. Increase speed to medium low and mix until dough starts to get smooth, about 1 minute. Increase speed to medium and mix until dough is smooth and stretches 3 to 4 inches without breaking, about 6 to 10 minutes more. Transfer dough to the oiled bowl, cover with a damp towel or plastic wrap, and set in a warm place until doubled in size, about 1-2 hours. Once dough has risen, punch down, shape, and grill as desired. While I make the dough, and the hubby is in charge of the grilling, it is really a 2 person job. We actually grill the dough on one half of the grill, usually on a medium-low setting. We keep the other half of the grill on high to keep the grill nice & hot, otherwise the crust burns and the cheese isn't melted. We usually only cook one at a time, but each only takes about 5 minutes total. Make sure all toppings are very easily accessible (all in bowls) to be able move quickly. 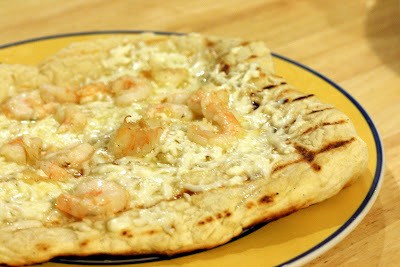 My hubby oils the grill with olive oil & a silicone brush, and I quickly place the dough on. He quickly oils the top of the crust & we shut the lid to the grill. It cooks for 1-2 minutes (will start to bubble). The hubs quickly flips, while I have the sauce in hand ready to pour in spread. Just as I'm finishing the sauce, hubs is putting the cheese down, and I grab the toppings. Remember, work quickly! Close the lid, and let it cook for an additional 3-4 minutes (check to be sure the crust isn't burning & the cheese is melting). Try to keep the lid down as much as possible to keep the heat enclosed. While this may seem complicated, it's actually quite fun and easy! (And, very affordable!) We rarely order or buy pizza anymore!